surprise your guests on your special day. to make sure that everything is running smoothly. 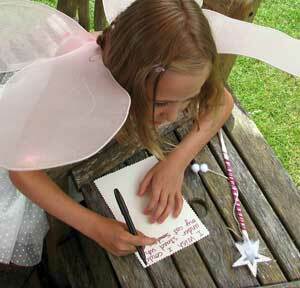 · Decorate your very own Fairy Wand to take home. · Have a Fairy Glitter Make Over. 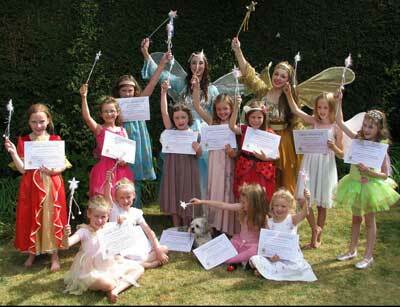 · Learn a real Fairy Dance with our real fairies. 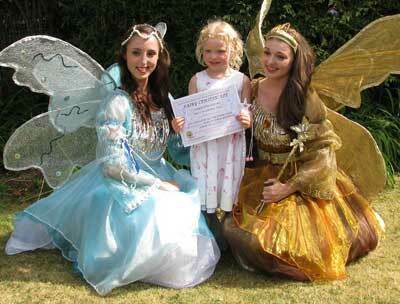 · And receive your very own Official Fairy Certificate!! 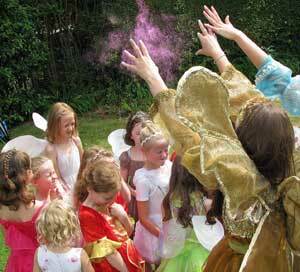 · Plus you and your guests will all receive a special Fairy Goody Bag to take home at the end of the party. We can come to your house/garden, or a hall where you have booked the venue for your party and will entertain the party guests for two hours with our own magical c.d. music mix. Singing and dancing. The Birthday girl is also crowned the Birthday Fairy with her own special tiara to keep and there are lots of other little surprises to keep your imagination flying. 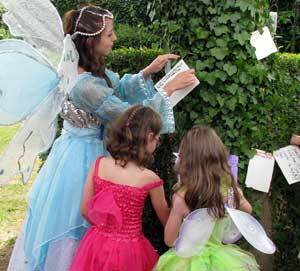 If we come to your garden we will find an enchanted wishing tree for all the party children to put their wishes on. You can order a Special Fairy Birthday Cake from us, if you wish, as well! 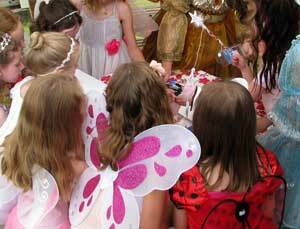 We have 4-6 different fairies to invite to your birthday party. So you may choose your two favourite colours. 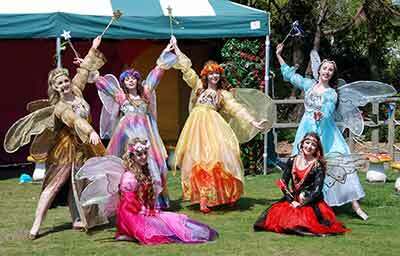 These special fairies are professionally trained in dancing and singing and they perform dancing fairytale shows at ‘Black Gang Chine’ on the Isle of Wight at the special fairy events each year. Blue & Silver ‘Fairy Shimmer’ our Sea Fairy. Gold ‘Fairy Chine’ our Princess Fairy. Pink & Purple ‘Fairy Rosebud’ our Flower Fairy. Red ‘Fairy Buccaneer’ our Pirate Fairy. and Rainbow Mix ‘Fairy Rainbow’ our Rainbow Fairy. or call 07917 765406 for more details and prices. Please note there is a Maximum of 15 children per party. Right, Fairy Rosebud; below left, glitter make-over and, below right, meeting the real Fairies, Shimmer and Chine. Left, writing a wish and, above, the wishing tree. Official Enchanted Fairies and, right, Wand Decorating. 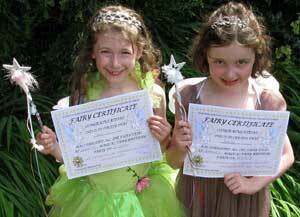 Feedback from Fairy Birthday Parties! 'It was the best fun ever! Thank you Mandy for making my party into the most beautiful birthday...' Jasmine age 8. 'Each fairy had a surprise party bag with lovely fairy gifts and the pretty fairy wands still look lovely today, thank you. 'I can’t thank Mandy and the team enough for the most magical birthday party for my little girl. 'It was an absolute pleasure to see the fairy girls perform for the children, they were completely enthralled and enchanted by the appearance of 'real live' fairies. Everyone, including all the adults loved them, I now intend to make a point of going to the I of W performance next time. continuous success at Blackgang Chine on the Isle of Wight since 2013. The real fairies from ShowCreations fly off to the Island for the magical ‘FairyFling’ event performing live story-telling dance shows and entertaining the children. There will be six magical fairies. Treat yourself to a family day out with the children. Our Real Fairies would love to meet you! There will be fairy workshops/live music/pirate & fairy fancy-dress competitions/mix fairy potions/dance shows/children’s entertainment and lots more! The fairies invite you to join in their fantastical Fairyfling, with all things magical on offer for would be fairies and their friends. 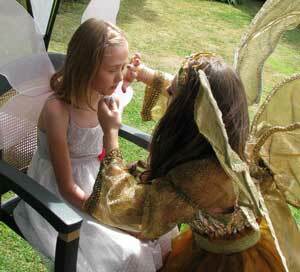 These beautiful fairies also sprinkle their fairy dust at local birthday parties in Hampshire. Pirate parties soon to be available for the boys. 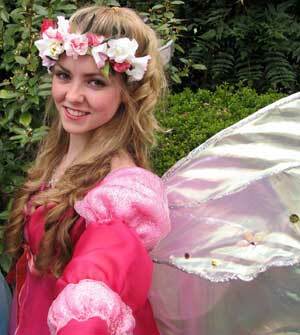 We create INDIVIDUAL SHOWS for you...an imaginative fairy show for your special event. 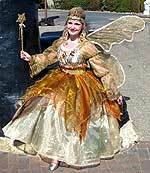 With four to six professional fairies with beautifully handmade costumes. Adults can sit back relax and enjoy. Children will be enchanted by the fairies. 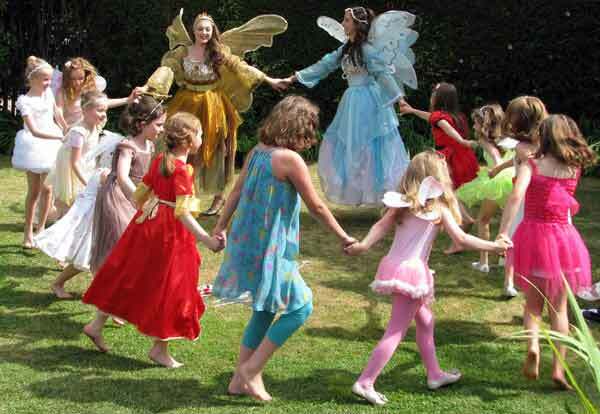 Have fun by joining in singing and dancing with our real fairies. The fairies may need your help during the story telling show. Let us take you on a journey into our land of imagination!! Wave your wands high in the air! keep the little ones entertained at your big event. We supply your complete Extravaganza! We also have a pirate fairy! So boys can also join in with their pirate swords! Children and adults can dress up too! If you wish. What's in the Fairy book this year? These all new shows are produced by Mandy Oakley who has worked with children for over 15 years and been in entertainment professionally for 31 years. Available for Summer, Easter and Winter seasons and for Cruise Ships, Holiday Centres and Holiday Parks in the UK and internationally. Events, Weddings, Anniversaries and Birthday Parties. Bring your Child’s imagination alive and let them be drawn into this beautiful magical world. Each show is a complete package of colourful handmade costumes, music and energy. Beautiful story telling fairy shows. Open your mind into a world of imagination. 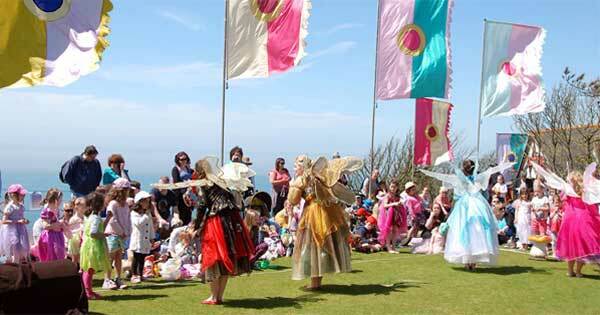 Be enchanted by our real dancing fairies and have fun by joining in the singing and dancing. The fairies may need your help during the story telling show. Wave your wands high in the air! We also have a pirate fairy! So boys too will love joining in with pirate swords! Let us take you on a journey into our land of imagination...a Fairy-Tale Show! This show is available all year round and for summer seasons. Make the festive season a special one by booking our children's Christmas shows. Adults will also have fun joining in our Christmas celebrations with all the family. Non-stop singing and dancing with audience participation. Mermaids and Pirates will take you on an exciting sea cruise journey. This exciting fun packed show takes you on an amazing adventure! With beautiful dancing mermaids and tough good hearted pirates. With Sword fights and love themes. Boys and girls of all ages will love these story telling performances. Bubbles and swords at the ready! They may need your help audience! Have a happy Halloween show with some spooky moments and dancing skeletons! Come in a happy or spooky Halloween costume too. Have fun at this time of year. Full of trick and treats. Children get ready to SCREAM!! It's full of fun – counting eggs, colouring, and lots more. Join in with the Bunny and see how you can hop, skip and jump. Sing and dance with Bunny and mates. Children come dressed up in an Easter costume or Easter hat and you could win an Easter egg!